Teeth may be lost to dental caries, periodontal disease, or trauma or may be removed when treatment fails. Missing teeth may cause cosmetic, phonation, and occlusal problems and may allow movement of remaining teeth. A bridge (fixed partial denture) is composed of false teeth cast or soldered to each other and, at each end, to a crown that is cemented to natural (abutment) teeth, which bear all stress of biting. A bridge is not removed. A bridge is smaller than a removable partial denture, but one or multiple bridges can be made to replace many of the teeth in a dental arch. A removable partial denture, typically an appliance with clasps that snap over abutment teeth, may be removed for cleaning and during sleep. Part of the occlusal stress may be borne by the soft tissues under the denture, often on both sides of the jaw. This appliance commonly is used when many teeth have to be replaced and bridges or implants are not feasible or affordable. Complete dentures are removable appliances used when no teeth remain. They help a patient chew and improve speech and appearance but do not provide the efficiency or sensation of natural dentition. When teeth are absent, the mandible slowly resorbs, resulting in ill-fitting dentures that require revision (called reline or rebase) or replacement. Alternatives are oral surgical procedures to enlarge the alveolar ridge or dental implants to replace missing teeth. An implant is typically a titanium cylinder or screw that replaces a tooth root. One or more implants are placed into the alveolar bone, where they ankylose. 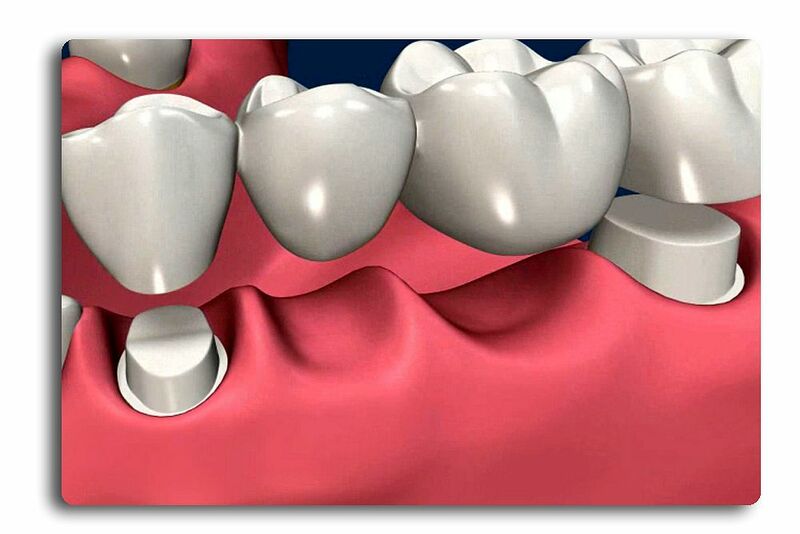 After 2 to 6 mo, artificial teeth are attached to the implants. Implants are not readily removable, although the prostheses they support can be. The potential for infection at these sites warrants scrupulous attention to oral hygiene. Generally, all removable dental appliances are removed before general anesthesia, throat surgery, or convulsive therapy to prevent their breakage or aspiration. They are stored in water to prevent changes in shape. However, some anesthesiologists believe that leaving appliances in place aids the passage of an airway tube, keeps the face in a more normal shape so that the anesthetic mask fits better, prevents natural teeth from injuring the opposing gingiva of a completely edentulous jaw, and does not interfere with laryngoscopy. Occasionally, the mucosa beneath a denture becomes inflamed (denture sore mouth, inflammatory papillary hyperplasia). Contributing factors to this usually painless condition include candidal infections, poor denture fit, poor hygiene, excessive movement of the denture, and, most frequently, wearing a denture 24 h/day. The mucosa appears red and velvety. Candidal overgrowth may be indicated by adherent cottonlike patches or, more commonly, erosive lesions on the mucosa. The presence of Candida can be confirmed by the microscopic appearance of typical branching hyphae. Without Candida, inflammatory papillary hyperplasia is unlikely. A new well-made denture almost always improves the situation. Other treatments consist of improving oral and denture hygiene, refitting the existing denture, removing the denture for extended periods, and using antifungal therapy (nystatin rinses for the mouth and overnight nystatin soaks for the denture). Soaking the denture in a commercial cleanser is sometimes helpful. Other options are applying nystatin suspension to the tissue surface of the denture and clotrimazole troches 10 mg 5 times/day. Ketoconazole 200 mg po once/day may be required. If inflammation persists, biopsy is indicated, and systemic conditions should be ruled out.